A snapshot shows the world what your camera sees, but a thoughtfully composed photograph shows the world what you see. While composition can be complex, several basic strategies arise when making pictures of natural subjects. Here are five such techniques for powerful image-making. 1. Lead the eye in. 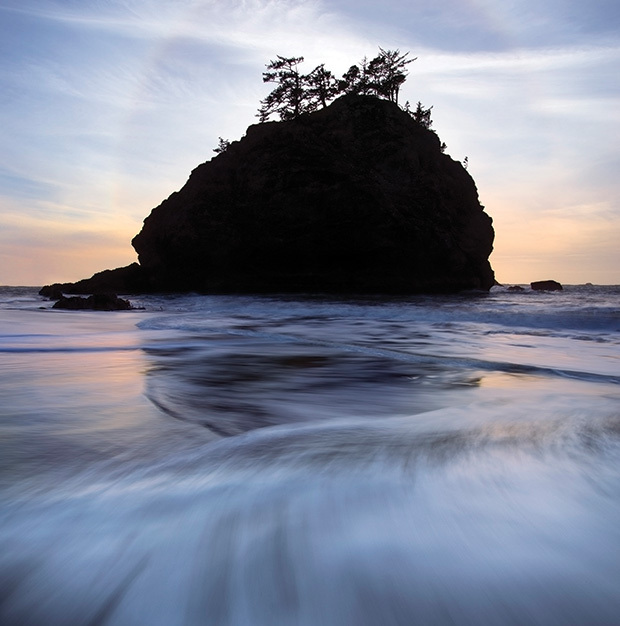 Sea stack, Samuel H. Boardman State Park, OR: A 1/2 sec exposure blurs the wave. Shot with a Canon EOS 5D Mark III and 16–35mm f/2.8L II Canon EF lens at f/16, ISO 50, on a tripod. One of the most effective ways to create a powerful composition is to use visual elements to lead the viewer’s eye into the scene. Leading elements can be just about anything—lines, curves, or a progression of shapes. Leading lines that stretch from foreground to background are especially powerful, propelling the viewer into the scene. In the image at left, I used an outgoing wave to act as a leading line. Other shapes placed in the foreground can do the same: a curving river can compel the eye to meander throughout the frame, whereas a triangle-shaped rock can point into the composition. Multiple elements can more subtly encourage the viewer to explore the photograph—a near-to-far, bottom-to-top visual progression is often particularly effective. 2. Find a good foreground. 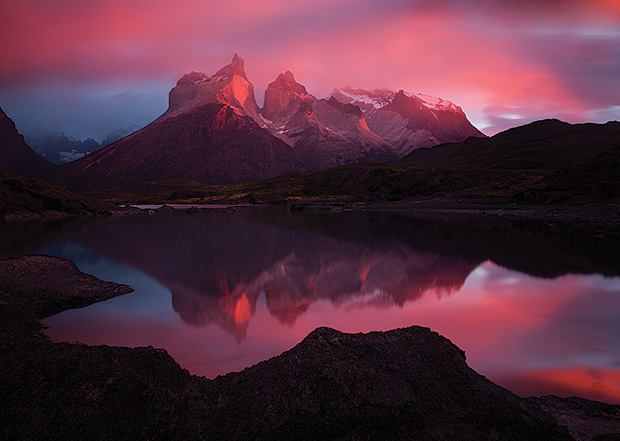 Los Cuernos, Torres del Paine National Park, Patagonia, Chile: A 24–70mm f/2.8 Di VC Tamron SP lens was used with a polarizing filter to intensify the colors, and a 3-stop ND filter for a cloud-blurring exposure: 30 seconds at f/11, ISO 100. Foregrounds add depth, and the best add punch, too. Providing a point of reference, they can simplify chaotic scenes. At this placid pool of water during a fiery sunrise, I backed up to incorporate the curving shoreline. Its shape frames the reflection of the mountains, enhancing the composition and adding depth to the image. 3. Engage the eye with repeating patterns. Tarn 2, Acadia National Park, ME: A polarizer over a 100–400mm f/4.5–5.6L Canon EF IS lens helped intensify the reflection of autumn colors. EOS 5D Mark III, 1.3 sec at f/32, ISO 100. People are naturally attracted to patterns, part of our ability and biological need to organize our chaotic world. When the eye explores one, it tends to want to visit each and every repeated element; accordingly, the savvy photographer can use repeating shapes and colors to encourage the viewer to visit multiple parts of the composition. Visual repetition gets the viewer’s eye moving, engaging interest and creating compositional energy. On the flip side, repetition can also help create harmony and balance, adding structure to a composition, as well as to create order in an otherwise chaotic scene. 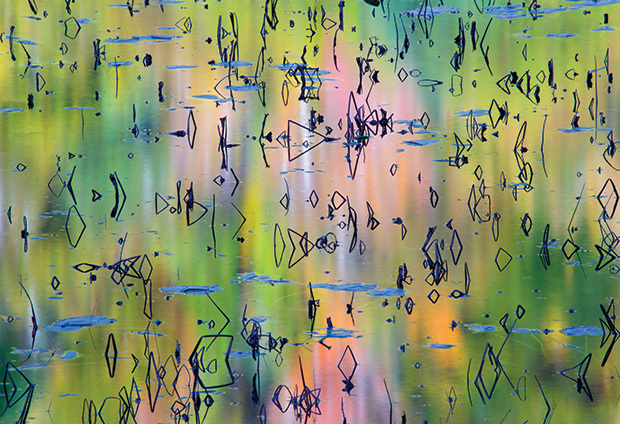 You can also create effective images by making the pattern itself the entire focus of the composition, as I did with the quirky shapes and patches of color in the little pond seen here. The less dynamic shapes of the lily pads floating in the water fade to the background, providing general structure and order for an otherwise energetic, chaotic collection of visual elements. 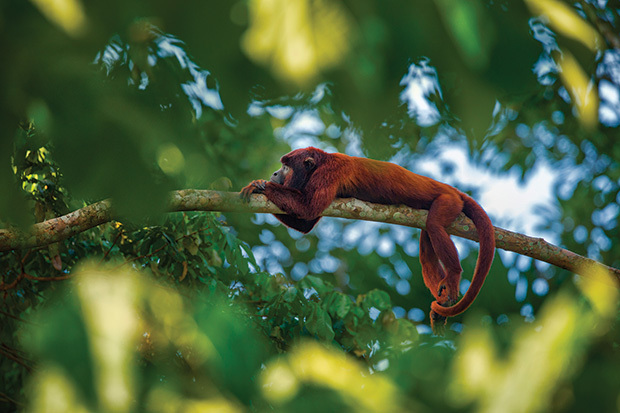 Red howler monkey, Tambopata National Reserve, Peru: A 500mm f/4L Canon EF tele with 1.4x Canon EF Extender III was shot wide open for shallow depth of field. Plant’s exposure: 1/200 sec, ISO 800, on his tripod-mounted EOS 5D Mark III. Use visual elements to direct your viewer’s attention to what’s important. Framing is one effective tool for simplifying and focusing interest. Examples include arcing tree branches, barn windows, and natural arches, but frames can also be made by arranging multiple visual elements around a subject. Sometimes it works best if there is an element of contrast between the frame and the subject—silhouetted trees around a sunlit mountain peak, for example. Another way to draw attention to your primary subject is through the use of light: spotlighting, or a dose of brightness behind your subject, can focus the viewer. For this image, I selected a position that framed the monkey with a pattern of out-of-focus leaves lit by the setting sun. A hint of that light on the monkey also helps focus viewers’ attention. 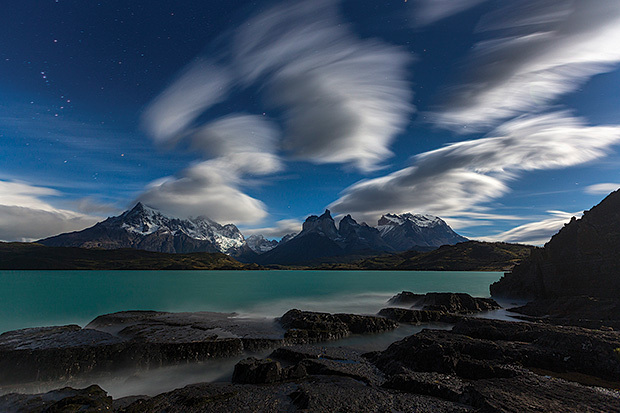 Lago Pehoe, Torres del Paine National Park, Patagonia, Chile: A 60-second exposure at f/5 created an eerie motion blur in the clouds. Plant used an EOS 5D Mark III and 16–35mm f/2.8L II Canon EF lens on a tripod for the ISO 400 shot. Look for ways to convey a sense of energy. Use lines or shapes that tilt or point in opposite directions; think of a line of trees whose branches reach at differing angles into a cloud-filled sky. But be careful: Too much energy going one way and not enough going the other can look unbalanced—a classic example is an animal running out of the edge of the frame rather than into it. Long exposures of moving elements can also convey a sense of energy; motion blur creates compositional lines and shapes, adding further interest. Here, the streaking clouds form staggered, diagonal lines, which add energy to the frame.